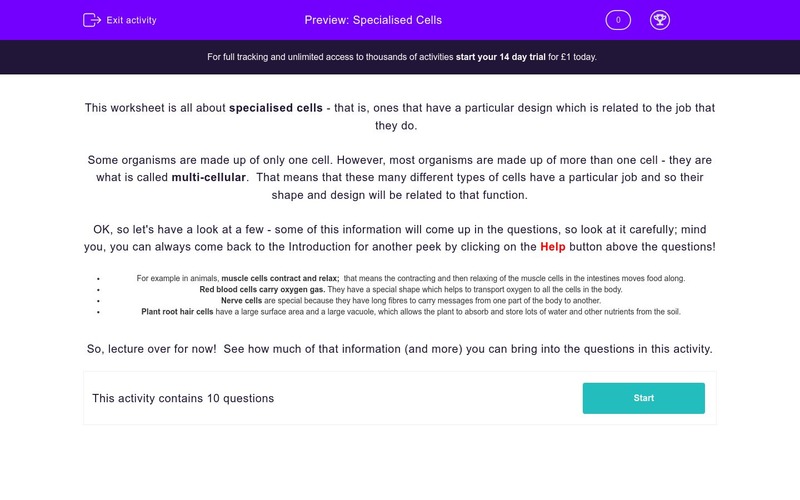 This worksheet helps students to look at a variety of different specialised cells and to use the information given to help them to decide what its function is. This worksheet is all about specialised cells - that is, ones that have a particular design which is related to the job that they do. Some organisms are made up of only one cell. However, most organisms are made up of more than one cell - they are what is called multi-cellular. That means that these many different types of cells have a particular job and so their shape and design will be related to that function. OK, so let's have a look at a few - some of this information will come up in the questions, so look at it carefully; mind you, you can always come back to the Introduction for another peek by clicking on the Help button above the questions! For example in animals, muscle cells contract and relax; that means the contracting and then relaxing of the muscle cells in the intestines moves food along. Red blood cells carry oxygen gas. They have a special shape which helps to transport oxygen to all the cells in the body. Nerve cells are special because they have long fibres to carry messages from one part of the body to another. Plant root hair cells have a large surface area and a large vacuole, which allows the plant to absorb and store lots of water and other nutrients from the soil. So, lecture over for now! See how much of that information (and more) you can bring into the questions on this worksheet. This question is about root hair cells. Look at the picture below of this type of cell. Tick TWO things from the list that the root hair cell absorbs for the plant to use. Choose the correct function of the nerve cell from the list below. Do you know what this one is? In fact it's a RED BLOOD CELL, but what does it do? Look at it carefully and decide what you think is the function (job) of this specialised cell. Look at it carefully and choose its job from the list. Look at it, think about it and decide what its job is. Doesn't look that specialised, does it? What do you think it does? Here's the list of possibilities - what do you think? Its job is to absorb a particular sort of energy for the plant - what do you think it is? Which gas is it designed to absorb? Look at that root hair cell - remember, it's tiny! Those little hairs poke out in between the soil particles, helping to massively increase the surface area for absorbing the water and minerals that the plant needs to grow healthily and operate normally. Look at that nerve cell - it's so long! Its job is to carry messages around the body, which it does by little electric impulses. Nerve cells join other nerve cells and so messages are carried with amazing speed from head to leg. Your blood is red BECAUSE of these. They contain a pigment (with the difficult name of HAEMOGLOBIN) which is made with iron, giving blood its red colour. Its job is to pick up oxygen from the lungs and carry it around the body to where it's needed. They are that shape because it means that even though they are small they can carry masses of oxygen. It's an amazing cell, the sperm, and its job is to SWIM towards the egg faster than all of the other sperm cells, to try and be the one which fertilises the egg. In its head is a package of information (the nucleus) and the sperm has to 'deliver' it to the egg - to do that it has a tail which it uses to swim. White blood cells are terribly important in helping to fight off disease. As you can see they are shape-shifters! When they come across invaders (like these bacteria) in the blood they engulf them, that is they grow around them and sort of eat them! You find muscle cells in all sorts of places around the body: obvious places like arms and legs, but also in the heart, intestines, tongue and so on. Their job is to move things and they do that by contracting (getting shorter) and relaxing (getting longer again). Epithelial cells line pretty much every tube in the body: mouth, gut, veins and so on; in fact those tiny blood vessels called capillaries are MADE of epithelium. So, their specialised job is to be the lining of the spaces in the body. It's kind of like pavement, or brickwork. 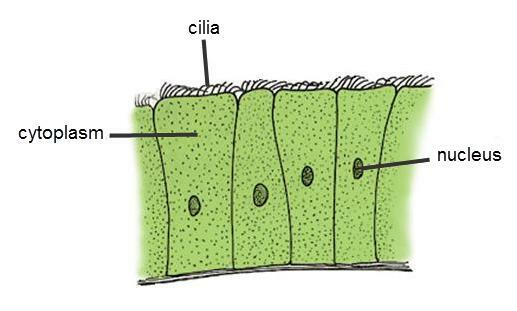 Look at the surface of the cell - all those wavy hair-like things are called CILIA and their job is to move things along. In the nasal passages (that's in the tubes running from the nose to the windpipe) those little cilia collect tiny particles of dust and pollen and pass them back up to the nose to be removed. 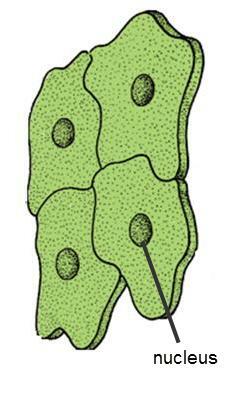 Pallisade cells line the top part of most leaves and they contain masses of green blobs inside called chloroplasts - those absorb the energy from sunlight and use that to make food for the plant ... and us! Pallisade cells are in the leaves - what's the job of the leaves? To make food for the plant. What do they need to do that? Sunlight, water (from the roots) and carbon dioxide (from the air) - that's what all those pallisade cells are doing; and thank heavens as we wouldn't be here if they weren't!